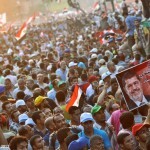 Weeks after president Morsi’s surprise move to establish democratic power in Egypt new tensions seem to arise in Cairo. Security forces have intensified their presence – a move that angeres drivers and residents, writes eufrika.org correspondent Abdallah Farid. Last Friday in Cairo, less than a thousand protesters rallied near the presidency, which Mohamed Morsi occupied since his inauguration in June. The main protest which took place in Cairo begun in the capital’s landmark Tahrir Square but after a spate of fistfights and stone throwing, only pro-Morsi demonstrators remain in Tahrir and the surrounding area, say sources, as marches celebrating Morsi and the Muslim Brotherhood took place along Talaat Harb and elsewhere downtown. While the majority of protestors have marched to the presidential palace from several locations, the protests drew a far smaller turnout than the mass demonstrations that helped topple Morsi’s predecessor, Hosni Mubarak, or the later rallies against the council of generals that took power after Mubarak’s fall. But the protestors were not left peacefully as the Former MP Mohamed Abou Hamed, one of the organizers of the protest, said in a statement that the Armed Forces closed down the street to prevent peaceful protesters from expressing their opinion, which is a sign of the return of a police state designed to protect the president. The protestors were chanting “down with the Supreme Guide’s rule.” They were referring to the leader of the influential Muslim Brotherhood, to which Morsi belongs. The protest organizers demanded that Morsi repeal an interim constitution in which he took over the military’s powers to legislate in the absence of parliament, which the army has dissolved shortly before his election. Also the protestors have accused Morsi of monopolizing power especially after his last orders to force retirement of two senior generals in the army after the deadly attack on Sinai that resulted in killing 16 Egyptians army officers and soldiers. The protesters in Cairo appeared to be largely made up of supporters of the former regime and those calling for Egypt to remain a secular state. Notably absent, however, were Egypt’s liberal and secular parties as well as the youth activists who helped engineer last year’s uprising against Mubarak. Brotherhood officials said they believed that the anti-Morsi protesters had hoped that the military would intervene against Morsi if mass protests broke out, repeating the scenario that forced Mubarak to resign. Injuries have been reported. Mamdouh al-Sherbiny, director of the Tahrir Square field hospital, said that four individuals sought treatment after these minor clashes. Three had been injured by birdshots and were transferred to Qasr al-Aini hospital, he said. The other had a broken nose from being hit in the face with a stone, and received treatment at the field hospital. The Health Ministry has denied that there were any birdshot wounds, saying that the cases referred to the hospital were suffering from bruises. State-owned Al-Ahram newspaper reported on its website that Morsy supporters and opponents were hurling stones at each other on Talaat Harb Street off of Tahrir Square on saturday afternoon. Al Jazeera’s Mubasher Masr reported that there were also fistfights between Morsy supporters and opponents in Tahrir this morning and reported that gun shots had been heard, but no injuries were been reported. As of saturday morning, military police had closed off all roads leading to the Ministry of Defense, spreading barbed wire and setting up security blockades, although no protesters showed up. The move angered drivers and local residents. Central Security Forces has intensified its presence at the presidential palace, alongside the Armed Forces. Osama al-Sagher, head of the Cairo Security Directorate, was present at the palace. He told Al-Masry Al-Youm newspaper that he came to supervise securing the demonstration. Security officers have instructions not to confront protesters who were committed to peaceful demonstrating, because freedom of opinion is guaranteed to all citizens, said al-Sagher, but he added that security forces will stop any attempt to assault the palace, riot, or vandalize public or private property.